I am thinking about that because this autumn is seeing my own work coming at the public from a variety of directions. Not to worry; the phase will pass and by December I will sink back into obscurity. But let's go over the details of my temporary onslaught. As I wrote last time, September marked my first appearance in an e-book anthology. I am sure by now you have all run out (or run your cursor over) to buy a copy of Malfeasance Occasional: Girl Trouble. Right? I am happy to inform you you won't have to spend any money for this next feature (although I do like dark chocolate if you're thinking of a gift). This one is a freebie. 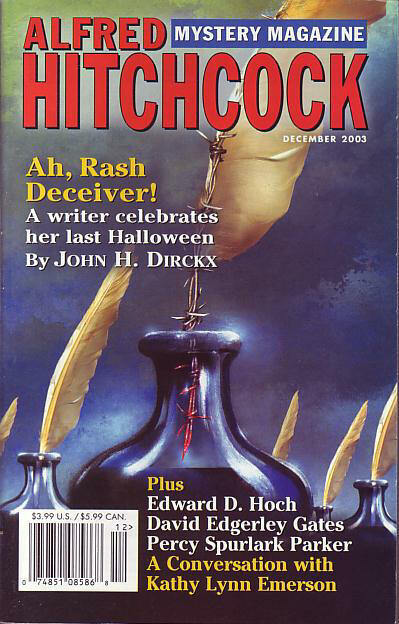 Linda Landrigan, who edits Alfred Hitchcock's Mystery Magazine, suggested doing a podcast of my story "Snake in the Sweetgrass," which appeared in the December 2003 issue of AHMM. And if it isn't up now here it should be by next week. She sent me the recorder they use and after much diligent practice I was able to record the story with only three mistakes. And that was the best I could do. Three different mistakes every time. (It wasn't like I consistently tripped over the same tongue-twisting phrase, alas.) Linda assures me they can clean that up. But here is the cool part. My story is about an elderly Kentucky fiddler and the title refers to a traditional fiddle piece that is his personal signature tune. It seemed logical to include a recording of that tune in the podcast. The problem with that is that I made up the name. There is no such tune. No biggie. My daughter, Susan Weiner, is a fine composer so she created a tune that matched the description in the story. And then, extra special treat, my wife Terri Weiner recorded it on the fiddle. So it is a real family operation and I recommend it highly. But if that isn't enough to entice you to give it a listen, here is a bonus. Remember, I said this is a media blitz. 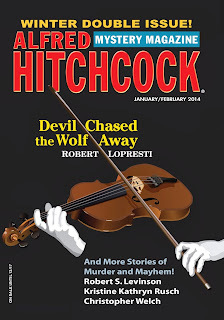 The January/February issue of Hitchcock's comes out November 4 and I am thrilled to report that the cover story is "Devil Chased The Wolf Away," a sequel to "Snake." And while you can read "Devil" without experiencing "Snake" you will definitely enjoy them more if you read (or listen to) "Snake" first. And next Wednesday I will explain how "Devil" came to be written, much to my surprise. Rob, congrats, but more important, thanks for sharing this info, especially the family involvement with the fiddle tune. Isn't it great to be part of such a talented family! I'm glad to know I'm not the only one who has trouble recording stories. I look forward to hearing that fiddle tune! Congratulations, Rob, to you AND the family. You hit the trifecta, Rob! Congratulations! I love it that the recording was a family affair--go Team Lopresti! Congratulations! I can hardly wait to hear/read/hear! Rob, I enjoyed "Devil Chased The Wolf Away" when I read the early version. Glad to see you made the front cover with that one. keep them coming.